MMT completed offshore integration trials of its new high-speed remotely operated vehicle (ROV) with Sonardyne International’s SPRINT inertial navigation system. The 2,000 meter rated vehicle, named Surveyor Interceptor, has been developed by MMT to improve the speed and efficiency of seabed mapping and pipeline inspections surveys. Its design features a hydrodynamic hull and powerful drivetrain enabling the vehicle to travel at up to six knots, around 50 percent faster than conventional Work-class ROVs. The accuracy of SPRINT complements the vehicle’s state-of-the-art imaging and mapping sensors, resulting in improved survey data quality and reduced ‘cost per kilometer’ of surveys, the developer said. Travelling at high speed close to the seabed requires the vehicle’s automatic maneuvering and propulsion systems to be supplied with highly precise and uninterrupted position updates. To meet this requirement, MMT selected Sonardyne’s acoustically aided inertial navigation system, SPRINT. Designed for subsea vehicles, SPRINT makes optimal use of acoustic aiding data including USBL, LBL and Doppler Velocity Log (DVL) and other sensors such as pressure sensors to improve accuracy, precision, reliability and integrity in any water depth. Inertial navigation is inherently self-contained and robust with very good short term accuracy but can drift over time. SPRINT is therefore aided with complementary acoustic positioning data to provide long term accuracy and robustness and greater vehicle control. On the Survey Interceptor, a Sonardyne Inverted Ultra-Short BaseLine (iUSBL) transceiver has been interfaced directly to the SPRINT resulting in a highly optimized navigation solution that delivered position updates up to 100 times a second. The system architecture inside SPRINT has been developed with flexibility and expandability in mind, meaning that the same vehicle-mounted hardware can be used as a premium survey vehicle grade gyrocompass or an acoustically aided INS depending on operational requirements. Users are able to upgrade and switch capability on demand using remotely activated in-field upgrades, meaning they only pay for the features they need. 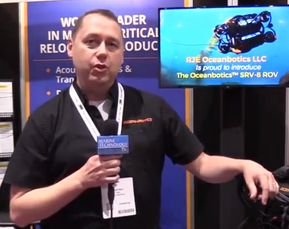 “When testing the new MMT Survey Interceptor ROV, we were looking for an inertial navigation solution that would deliver real-time performance with high speed updates,” said Jonas Andersson, R&D Manager at MMT.